2 Apr: We got a little spoilt by Nancy, who brought us a bag of goodies from Chokladfabriken including this box of chocolate. 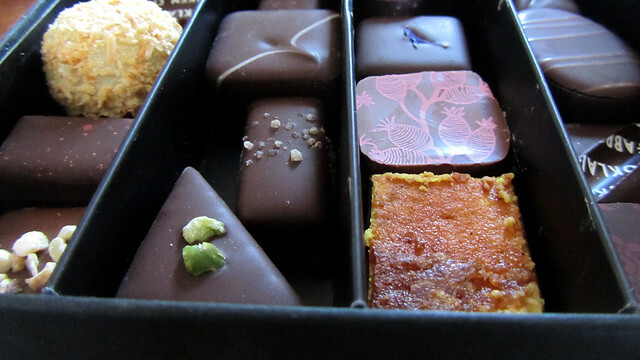 Frédéric gave it two thumbs up, and I certainly was swooning after biting in half of a particular caramel-filled piece. Up to then, I have been sharing each flavour with Frédéric so he also got to try every flavour in the box, and I was so so so tempted to finish that one up all by myself! 3 Apr: More Mr Chat around Paris! 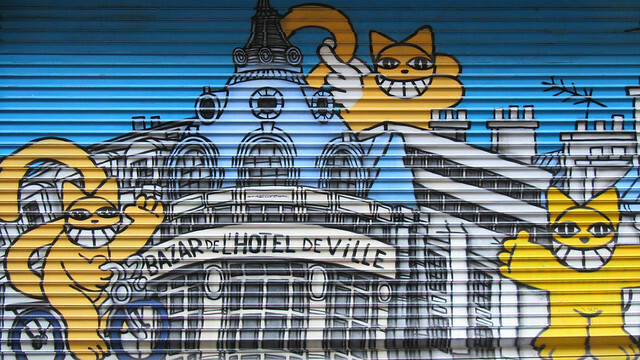 BHV has several premises clustered around the Hôtel de Ville and a long mural of these grinning cats can be found between the pet and the men stores of BHV. This piece of street art has been bugging me a while and yet I couldn’t put a finger on as to why, until I relook at the top cat up at the roof. The body of the cat was totally unnatural, and is that supposed to represent a flying cat, or has someone added additional hands to keep the cat bound? 5 Apr: Playing with words and their sound is a bit of a French specialties. I especially like it when they create cleverly punned greeting cards, like this one here. 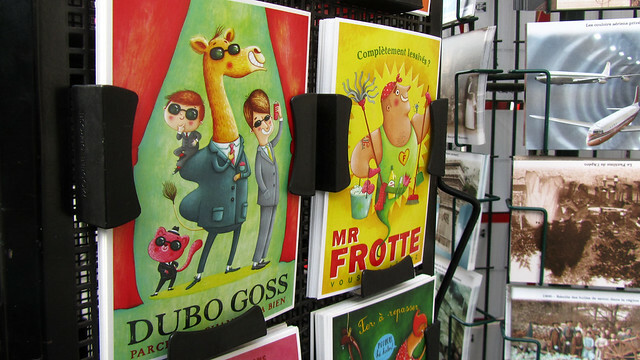 Thinly veiling a jab towards Hugo Boss on this postcard is the words which sound refer to handsome guys (very informal – de beau gosse), and there were many more examples on that postcard shelf. Many, I believe, were inspired by old-style advertisement and now infused with day-to-day jokes and casualness. 6 Apr: As we are not big coffee drinkers, we stock a lot of tea varities in our home so we can make not-chocolate hot beverages, and drink any of the types in accordance to our mood. 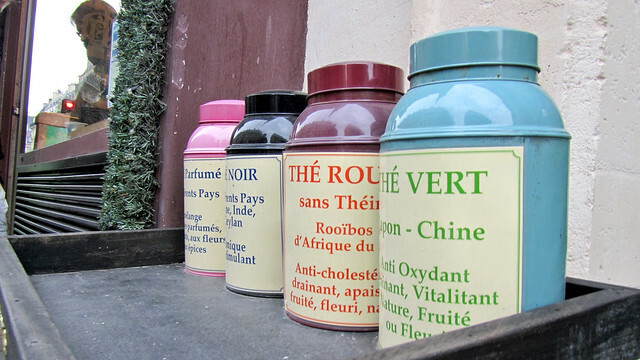 Outside the Mariage Frères, a few canisters of tea have been placed outside the shop, with brief discussion of the various teas. A quick count tells me that we have over 10 types of tea in our place, so I guess that means I won’t be buying anymore new tea anytime soon. 7 Apr: We were at the cinémathèque française today to catch the premier of Wong Kar Wai’s The Grandmaster, slated to open in theatres in France 10 days from now. After the movie (and lunch) we decided to go for a walk and this is the view towards Paris city centre from the Passerelle Simone-de-Beauvoir. 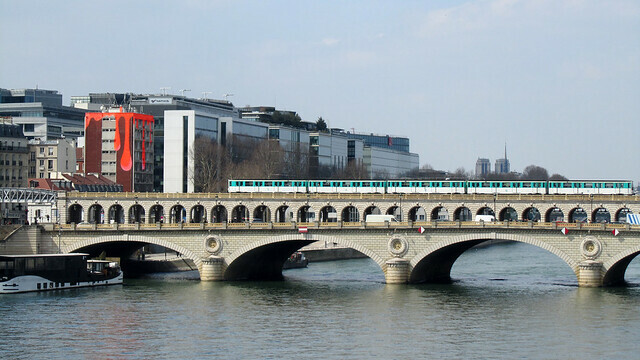 Spot the Notre Dame, the iconic Parisian metro, and a building slated for demolition but currently sporting a façade of overflowing paint pot. Brunch with Jean Imbert Is it expensive to live in Paris? I love the light on the peacock, very nice! 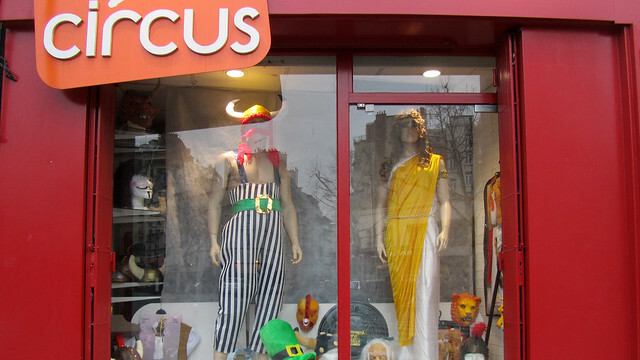 I suppose if there are any in Paris, you will hear them, they have a very distinctive call. I also enjoy word games in French. I like their clever puns but sometimes I still feel I don’t get it, probably due to lack of knowledge of certain slangs. a peacock in paris…a fat looking one too! Are they native? I doubt the peacock is native, especially given the spotting location being Parc Floral, could well be a transplant. 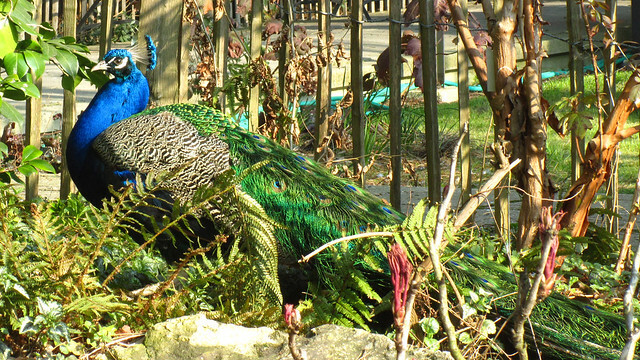 If you are interested to see more peacocks in Paris, go to the Parc de Bagatelle in Bois de Boulogne. I’ve seen plenty there and if you are lucky, you get to see some in dancing mode. Thanks for the tips Janice. F and I always talk about going to Bois de Boulogne but we have been rather lazy about it. More reason to be motivated now!